Many might disagree, but I find Dan Brown's books entertaining. He combines mystery, intrigue, and my favorite conspiracy theories with facts and historical figures to weave good page-turning yarn. I end up finishing the book in one sitting. I always guess who the bad guy is, but it's still a compelling read. I thought The Da Vinci Code was movie-ready, but was sorely disappointed by Ron Howard's lumbering film adaptation. So I went to see Angels and Demons with lowered expectations, and left feeling satisfied. Secret societies---no wait---even better---The Illuminati?! The Vatican? The Hadron Collider and anti-matter? Enough said! I'm there on opening day! Director Ron Howard has said that he doesn't want to repeat himself so he doesn't like to do sequels (although the book Angels and Demons actually preceded The Da Vinci Code, so it's technically a prequel). Thankfully, he didn't repeat himself in this one. I'm impressed that he made a fun, fast-paced and absorbing thriller, complete with a pulse-pounding Hans Zimmer musical score. 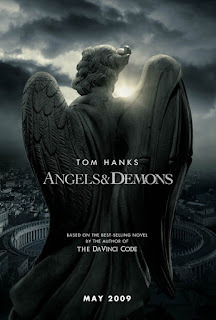 Tom Hanks is back as the symbologist Robert Langdon (but with a better haircut) to save the Catholic Church, the accomplished Ewan McGregor as the Camerlengo, Ayelet Zurer as the physicist Vittoria Vetra, Stellan Skarsgard as the Swiss Guard Commander Richter, and the always exceptional Armin Mueller-Stahl as Cardinal Strauss. The script is tighter (mainly because the book is not as convoluted as Da Vinci, and the bomb threat naturally comes with a deadline). There are some plot changes but nothing that interfered with my enjoyment of the film. I especially relished the insider's look at the Church, all the rituals and ceremonies that come with the passing of a Pope and the election of a new Vicar of Christ. The tour of Rome and Vatican City, taking a pretend-peek into the Vatican Archives and its treasures, and the eternal debate between science and religion also rank high in my points of interest. So if you just want to savor a popcorn potboiler and be diverted for 2 hours, go see Angels and Demons. You'll have a hell of a time.